Take a vacation and let your plants look after themselves with authentic Austrian-engineered Blumat Juniors. These are the Original Blumats and are superior in design, material quality, and durability to counterfeit products. After years of testing, Blumat has created one of the most efficient and reliable automatic watering devices on the market. The ceramic cone is porous and allows water to be absorbed and released when placed in wet and dry mediums, respectively. As water is drawn from the cone and into the growing medium this creates a vacuum which draws water from the nearby container of water. For tropical plants or plants that need more water, raise the reservoir to create additional head pressure (water pressure resulting from gravity), thus increasing the flow of the water. For cactus or plants that need less water, lower the reservoir to even with the plant to only allow watering when the medium is almost completely dry. Since the ceramic cone only releases small amounts of water slowly, your plants will not experience over watering (which can drown the plant) or under watering (which can result in stunted growth and root damage) thus encouraging prolific growth in all plants! Blumat Juniors will only draw water up to 12 inches from below the cone. If the surface of the water in your reservoir is lower, the flow of water will be restricted and the plants will dry out. In some cases, several cones may be necessary for larger plants to meet higher water needs. In this case, a larger reservoir should be used. 1. Fill a bowl with water. Remove the top of the Blumat. Put both the into the bowl for at least 15 minutes. 2. Holding the cone and cap underwater, knock out the air bubbles and press the top on tightly. 3. Push the ceramic cone into the soil. 4. Put the hose at the bottom of the container of water. Add liquid fertilizer if necessary. MADE IN AUSTRIA with the highest grade ceramic materials. Includes 5 Blumats for Potted or Hanging Plants. GENUINE BLUMAT - Watering stakes connect universally to nearly all plastic water bottles. Attach to a full plastic water bottle. Then, poke a hole in the top of the bottle (allowing water to release), and stick the Blumat near your plant's base. It's that simple. LONGER LASTING than knock-offs. On average, a Blumat stake with a 1L bottle will last 5-7 days, as compared to other stakes that last 2-3 days. The secret lies in the specific porosity of our ceramic-see for yourself! BETTER THAN THE OTHERS - We've tried terracotta wine bottle stakes, ceramic stakes, and glass globes. They over water, make a mess, and ultimately kill your plants. So stick with the original, Austrian engineered, Blumat Plant Watering Stake. 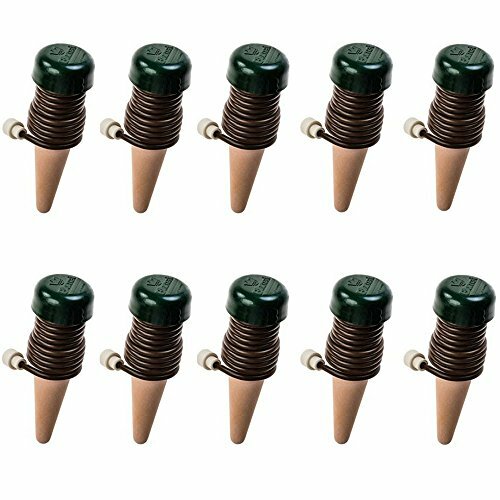 100% MONEY BACK GUARANTEE - If you aren't happy with your Blumat Garden Spikes, which is rare, you can send them back for a full refund, no questions asked.